King Philip II of France, also known as Philip Augustus, has a very convoluted marital history. He seems to have had little regard for his wives and in some ways, he reminds me of the oft-married King Henry VIII of England. In this article, we will take a look at his first wife, Isabelle of Hainault, the mother of Philip’s successor, King Louis VIII. Isabelle was born in Valenciennes in April of 1170. She was the daughter of Baldwin V, Count of Hainault and Marguerite I, Countess of Flanders. Little is known of Isabelle’s early life and education. When she was one year old, her father agreed to her betrothal to Henry the future Count of Champagne. Henry was the nephew of Adèle of Champagne, the Queen of France and mother of the future King Philip II. In 1179, both Isabelle’s father and Henry’s father swore an oath that the marriage would take place. But Baldwin later reneged on this oath. Isabelle’s maternal uncle, Count Philippe of Alsace had great influence at the French court of Philip’s father King Louis VII and arranged the marriage between her and Philip. Baldwin could truthfully claim to be a descendant of Charlemagne. Chroniclers at the time saw the marriage as a union of the Carolingian and Capetian dynasties. It was the hope of the Flanders relatives that having a family member who was Queen of France would give them influence at court. This did not make Queen Adèle happy as it was seen as a rejection of her nephew Henry and signaled a decline in influence for her and her family. Isabelle’s dowry included the county of Artois along with the cities of Arras, Bapaume and Saint-Omer. The transfer of Artois was dependent on Isabelle having an heir. The ten year old Isabelle and fourteen year old Philip were married on April 28, 1180 at Bapaume with the ceremony being performed by the bishops of Senlis and Laon. There were very few French nobles in attendance despite the fact that a royal wedding should have been a state occasion. Then for some inexplicable reason, Philip insisted Isabelle’s coronation on May 28 take place at Sens instead of Amiens, the traditional place for this ceremony. Canonical age for marriage at the time was fourteen for boys and twelve for girls. So Isabelle was not old enough for consummation of the marriage for another two years. Five months after the marriage, King Louis VII died and Philip became king. Isabelle’s parents were stalwart backers of Philip’s policies in Flanders at first. Isabelle was highly praised by the chroniclers and the marriage was peaceful until the political climate changed in 1183. By that time, Philip was more than ready to have an heir. He had quarreled with Count Philippe of Alsace and was waging war against Flanders and was angry that Isabelle’s father was supporting his enemies. In March of 1184, Philip convened a council at Sens to announce his intention to repudiate Isabelle. Although he refused to give his reasons for the separation, it was widely believed he wanted to break with Isabelle’s Flemish relations at court. Isabelle wasn’t going to allow this to happen. She dressed in the robes of a penitent beggar and walked barefoot through the streets of Sens appearing in the churches in an effort to gain the people’s sympathy. She mobilized a huge crowd and they all made their way to the castle where the anger of the people was so loud, Philip couldn’t fail to hear it. It was clear to him that Isabelle had the support of the people. This and the intercession of Philip’s uncle Robert led him to drop the repudiation. The fact that he would have lost Artois along with his wife also may have been a factor in staying married to Isabelle. We don’t know exactly what Isabelle’s role was in Philip’s life after this but she did maintain her title and honor as queen. She also gave birth at last to a son named Louis on September 5, 1187. Artois was now fully in Philip’s possession. It was another three years before Isabelle became pregnant again and she experienced great difficulties. 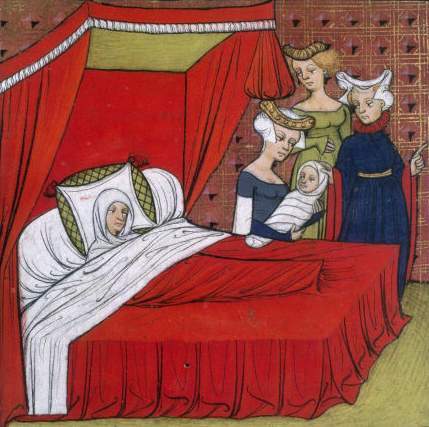 On March 14, 1190, she gave birth to twin boys but sadly she died a day later. The twins only lived for four days. Isabelle was buried in the Cathedral of Notre Dame and greatly mourned by the city of Paris as she had become a well-liked and admired queen. In 1858, her tomb was opened and her body exhumed and measured. She would have stood at 5’8” to 5’9”, extremely tall for the time. Philip was deep into preparations for the Third Crusade along with Richard the Lionheart of England when Isabelle died. Despite her death, he did leave for the Holy Land where he quarreled with Richard and the crusade turned into a great disappointment. Philip returned to Paris on December 27, 1191 and soon began looking for another wife.